The Cobblers have no fresh injury concerns ahead of Saturday’s Sky Bet League Two clash with Crawley Town at the PTS Academy Stadium (ko 3pm) - but there is still no return in sight for the club’s injured trio of players. That means that Sam Foley (back), Marvin Sordell (knee) and George Cox (ankle) are all out of the match with the Red Devils, who sit just one place and one point below the Cobblers in the table. There was some concern that David Buchanan may be struggling after he suffered nasty bruising in the 1-1 draw with Lincoln City last weekend, but assistant boss Colin West has confirmed he will be fit to play. The left-back was on the receiving end of the reckless challenge that saw Harry Anderson red carded at Sincil Bank, but got up and carried on playing until the end. That was when the extent of the damage to Buchahan’s lower leg was revealed, and although West admitted that was a shock to him, he says he wasn’t surprised by Buchanan’s reaction. 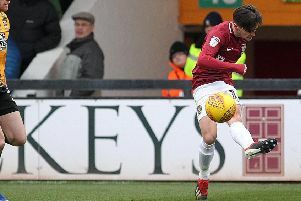 “David is a tough cookie, and to be fair we were a little bit shocked when he took his sock down on Saturday, but that is the type of fella he is,” said the Cobblers assistant boss. On Foley, West said: “Sam is coming along slowly, and you can’t rush things like that. And it is a similar story for Sordell, who only signed on loan from Burton Albion on deadline day.